Santa Cruz Bolivia: Santa Cruz de la Sierra Bolivia. Major Cities of Bolivia. Welcome to Sunny Santa Cruz Bolivia! The department (state) of Santa Cruz occupies almost the entire Eastern and South Eastern section of Bolivia and is the largest of the country's nine departments. It borders Brazil to the East and Paraguay to the South and is mostly tropical and sub-tropical containing parts of the Amazon basin and rainforest to the North, desert-dry forest savannahs to the South, and the temperate foothills of the Andes Mountain range to the West. You can truly enjoy any type of climate or topography somewhere in Santa Cruz. Here, agriculture, animal husbandry and ranching are the main industries, as are timber, mining, oil and natural gas. Click here to see the top 100 Things to Do in Santa Cruz. Tourism has not been promoted as actively here as in Western Andean Bolivia and this is surprising given the amazing array of wonderful attractions, the beautiful balmy climate, and the hospitality of its people who are playfully known as "cambas" (a Guaraní word that means "friend"). However, tourist infrastructure is rapidly growing and there are many types of hotels and accommodations, such as beautiful tropical hotels for visitors. 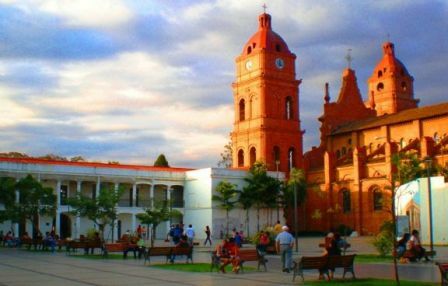 The city of Santa Cruz de la Sierra is located in the western section of the Department of Santa Cruz, and is its capital city. Situated at the foot of the sierras, where the Andes Mountain Range begins to rise off the tropical forest floor, its location is part of its name. According to the latest census, which was over 10 years ago, it has over 1.7 million inhabitants and is currently the largest city in Bolivia. However, current estimates put the population of this state at about 2.4 million. This is an amazing fact, especially since I can remember just a few years ago (in 2002) when citizen ONE MILLION was born and a huge deal was made out of the fact that the city had reach one million! This means that the city's population has nearly doubled in just 10 years! This page has a list of interesting and important facts about Santa Cruz and you can read more about the ten major cities of Bolivia here. At 416 meters above sea level, it is warm and tropical most of the year. Winters are short and last only 2-3 months but can get very cold very suddenly. "Surazos" (southerly winds that blow in from Argentina) can drop the temperature by as much as 30 degrees overnight. Not to worry, this extreme cold lasts only a few days at a time and beautiful, sub-tropical Santa Cruz is pleasant throughout most of the year. Here the climate varies by geographical zone: temperate to cold in the western sierras and warm to hot and humid as one descends into the extensive plains. See more about Bolivia's geography. The city was initially established in 1561 on the plains of Grigotá, just a few miles south of present-day San José de Chiquitos (and about 200 kilometers from its present location) by Spanish Captain Ñuflo de Chávez, who named the city after his birthplace in Spain. His biggest legacy was the expansion of colonization throughout virgin rainforest and savanna areas in southeastern South America (Argentina, Uruguay, parts of Brazil, and Bolivia). The Spanish attempted to convert several groups of native peoples in the immediate area to Catholicism; the Guarani, Moxeños, Chiquitanos, Guarayos and Chiriguanos are a few of these groups. There were some problems with parts of the indigenous population (they revolted in 1573 and destroyed much of the town) and Santa Cruz was resettled near the shores of the Rio Grande. However, conditions were not the most adequate there either and so the city was moved again to its present location of the banks of the Piraí River in 1592. (At the time of course, its population numbered less than 10,000). Today, you can still visit the original site of its establishment which is called "Santa Cruz la Vieja". In the sixteenth and seventeenth centuries it was considered a border town as it was surrounded by indigenous groups and was a hub for expeditions by missionaries from the Jesuit and other Catholic orders passing through on their way to the Moxos and Chiquitos regions where they established and built churches which today, are the very famous Jesuit Missions, among the most popular tourist attractions in Bolivia. Through the 1950’s it was still considered a small, marginal city with a population of only 25,000 (see videos here) while throughout the entire department the total population was only 300,000. However, in the early 60’s, with the development of the nation's transportation systems, highways and railroads Santa Cruz saw its economy boom as it became integrated with national and international markets. Less than 50 years later, Santa Cruz de la Sierra had become the largest city in the country, and the department of Santa Cruz now has a total of about 2.5 million people. The video above (English subtitles) explains how this happened so swiftly. Today Santa Cruz is modern and prosperous and Bolivia’s financial center. It is quickly becoming the most developed region of Bolivia and currently supplies nearly 40% of the country's Gross National Product and up to 50% of all taxes paid into the national treasury. Demographically, it is one of the fastest growing regions in South America and economically is Bolivia’s most important region due to the expansion of its agricultural and tourism industries. The department's economy was greatly bolstered by the capitalization of the petroleum and gas industry in 1997. However, the industry was again nationalized in 2006 under President Evo Morales and both investment and production have since decreased dramatically and there are frequent shortages domestically. Because it supplies such a large part of the GNP (and it produces over 60% of all the food in Bolivia), the Department of Santa Cruz led a movement to pressure the national government to allow each of the nine state governments to be autonomous, in order to govern some, but not all, aspects of its own development. 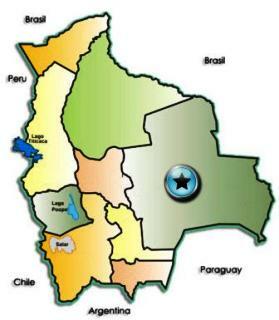 Several other departments (Pando and Beni to the North and Tarija to the South - all tropical and subtropical, or oil producing regions) joined Santa Cruz in wanting autonomy. Because geographically they cover the northern and eastern half of the nation in the shape of a half-moon, they came to be called the "Media Luna" states. Naturally, this was met with great resistance from the central government and the other 5 departments that occupy the western half of the country, although Cochabamba was split on the issue, and the Media Luna states were accused of wanting to secede from Bolivia to form a new country. In 2009 Bolivia voted on the issue and overwhelmingly supported autonomy, which is now guaranteed in the Bolivian constitution. Today all 9 Bolivian departments are autonomous, although their autonomy is severely limited and they continue be met with resistance when attempting to put it into practice. Other main industries in the Department are agriculture, forestry, animal husbandry, and mining. The department produces cotton, sugar cane, tobacco, soybeans, rice, vanilla, coffee, sunflowers, cacao, peanuts, yucca (manioc), Brazil nuts, and many citrus and tropical fruits and vegetables. Oak, mahogany, and a variety of unusual and beautiful tropical woods such as tajibo and tarara can be found in Bolivia's Eastern forests. Click here to read more about our natural resources . Bolivian and foreign companies have invested greatly in large forest concessions and the lumber industry exports to North America, Europe, Asia, as well as neighboring Latin American countries. Furniture, parquet flooring, windows, doors, moldings, and other finished products are also exported. Brazil nuts and hearts of palm, extracted from these same forests, are now also large industries in Eastern Bolivia. One of the major areas of business and investment in Bolivia is animal husbandry and the quality and number of heads of cattle have both increased dramatically. Breeding cattle have also been introduced such as Cebú, Holsteins, and Santa Gertrudes, all of which have adapted well to the tropics of Eastern Bolivia. Pigs, sheep and horses are also bred very successfully. In the Southeast there are several mines, such as the Mutún iron and manganese mine (one of the largest iron ore mines in the world) which was to have produced over 100,000 tons of steel per year. However, the government and Jindal Steel, the company contracted to operate the mine, have rescinded their agreement. The Colorado River is mined intensively for gold, and in the Chiquitos area there are mica, tin, silver, manganese, platinum, lead and gold mines as well. Other gems such as the ‘bolivianita’ are also produced here. Click the link to view the beautiful legend of the bolivianita. Emeralds, and quartz are also mined here. The area's transformation into a major economic hub began in 1953 with the National Agrarian Reform during which time the national government invested heavily to modernize technology and improve agricultural and industrial production systems to diversify and increase production. In addition, construction of major highways and railroads, and Viru Viru International Airport through and in Santa Cruz connected the city to other regions of Bolivia and neighboring countries such as Brazil, Paraguay and Argentina. Thus, the region became much more attractive to both national and foreign investors and as a result, migration to the region increased as well: 45% of all imports into Bolivia enter through Santa Cruz. Some of the ethnic groups native to the Department of Santa Cruz, mainly from the tropical forests and other impenetrable regions, are the Guarayos, Guaraní, Sirionós, Chiquitanos, Chamacocos, Zamucos, Lenguas, Tapietes, and Yuacarés, among many others. Not native to the region, but increasing in presence due to immigration are the Aymara and Quechua populations which have migrated to the city in record numbers over the past 10 years. The remaining population is of Spanish descent and there are large communities of foreigners as well. “Cruceños” are generally easy going, hospitable, warm and inviting, but are also intensely protective and proud of their social and cultural heritage. Santa Cruz has grown quickly and dramatically over the past 25 years (doubling its population during just the last 10 years). It is a vibrant, exciting region in which to live work, and volunteer There are always many things to do Here you can actively enjoy and experience its history while participating in its phenomenal growth and modernization. Despite its ethnic diversity, cruceños are fiercely proud of their traditions and culture and this is reflected greatly in the local food, holidays, festivals, the arts, music... and in a little word you'll need to learn if you plan to spend some time here..."Eláy!" Pronounced "el-EYE! ", it is used at the end of a sentence to firmly emphasize anything important you have to say or to show how strongly you feel, as in: "Aaah...Santa Cruz" (look up dramatically, put your hand on your heart, take a deep breath) "Eláy!"